The other day I released a copy of my first book review for Standardbred Sport Horses to my friends on facebook. One of them, Denis Crane, a top show jumper breeder in Australia, shared the post with his facebook friends. And ka-boom, the fireworks went off immediately, because a few of his 'friends' took strong offense with the reviewer's statement: "not realizing that the ability to achieve in sport came not from the warmblood breed base but the addition of the true sport elements into the breed--the English, Irish and American sport breeds". One of Denis' friends was so infuriated that she dismissed the review as "a lot of rubbish" (without reading the book) and then proceeded to dazzle us with her knowledge. Poor Denis, who is justly proud that he and his breeding program were featured in the book, was happily sharing it with his friends, probably expecting them to be part of his joy. Evidently they cared not about his feelings, and without reading the book decided to rip it and me apart. I did try to communicate with the woman who came out swinging right away but she insisted on hearing things I was not saying and when she became exasperated enough at my lack of proper response she brought in a European friend to pound me into shape. The rhetoric became so crazy that after 3 days---yes, it went on for that long...maybe longer, because I stopped reading it, I just dropped out of it. What in the world would cause such uproar? It's the fact that Europe did not invent the sport horse...somehow that pushed them over the edge into near hysteria. Being a pedigree specialist and equine historian, I spent over 30 years researching sport horse breeds and bloodlines. In that pursuit I have published a well-respected information website with over 60 articles on it and written 3 books (references for sport horse breeders), as well as built my own pedigree database of sport horse bloodlines. My work is not hidden, it is published and documented. In the last several years I had made it a practice to extend all pedigrees until the recorded parentage vanishes; a discipline that gave more depth to my understanding of breed origins, and some of the findings were startling to me, and evidently shocking to others. It became clear several years ago that I could trace sport traits that power our modern sport horses back to a single ancestral source in the 1500s in Ireland. And that the ancestry of the Irish Hobby could itself be traced back historically 2000 more years to 700 BC in northern Spain, and even beyond that back to its further origin. And the inconvenient truth is the modern DNA studies appear to agree with this genetic trail, the breed migration factors, as well as the speed gene, gait-keeper gene, and even the controversial large heart factor all trace back to those early sport horses. So, I have amassed pedigree information as far as it goes, which along with the historical records and even the DNA results, and it all tells the same story. Really, it is not too hard to follow the trail, because sport ability was noticed and celebrated and exploited for centuries, and the horses that provided it were noted and appreciated. The Greeks wrote about this strain in 67 AD, the Romans preferred the same stock for their coliseum races, and the Irish were conducting chariot races in this time frame with the same base stock. Wherever this peculiar breed went it improved the sport and agility of the stock it was crossed on. The record is there for anyone to see who takes the time to do the research. For instance, John Wallace wrote about it in 1895, as did Alexander MacKay-Smith in 1983 and 2000. Somehow my warmblood correspondents have convinced themselves that their ancestral stock, whether based on the Black Marsh Horse, Schwere Warmblud or Norman Draft (plow and cart horses) of the continent, provided the genetics and the ability to run fast, jump high and be agile light saddle horses. There is no evidence of this in the DNA trail, in historic accounts, and absolutely not in the pedigree record, yet they say it is so, therefore it must be so. One of the attackers in his tirade even spewed out that the Thoroughbred racehorse was a product of Europe, not England, because, let me quote: "And TBs came also from Europe and their origine is original from the Arabian/Oriental horses." This outburst displays a notable lack of knowledge in modern DNA findings, which prove it was the "native english horses" not the orientals, that provided the speed that made the Thoroughbred possible, and that far fewer orientals entered the gene pool than previously assumed (Bower 2010, Hill 2012). And orientals...doesn't that mean Barb, Arabian, Turk? Are we to believe those breeds were developed by the Germans also? My requests for bloodlines, or sport results, or historical material to support their claim on sport coming from Germany from these outspoken detractors was consistently met with no response or a return to their mantra that horse breeding was carried on back then. Well, yes we can agree that horse breeding was practiced back in the dark ages everywhere that man had settled, that is how man lived and moved: horses. So yes, we can surely agree that horses were bred in their native land, the surprise would be to find horses had not been bred then, and we find in those rare instances when there was no equine breeding that other modes of transportation and draft were readily available such as boats, camels, donkeys, oxen etc. And of course the people of the day loved their stock, as every horseman down through the ages has. We all love horses. But the question is whether the horses being bred were sport horses or utility horses? And in most cases they were clearly utility horses. Sport horses are a luxury, not a necessity, and if they are being bred for a sport then it follows there is an expression or testing of that sport, a contest of some kind, and with the usual noting of the results (such as pictured above). Sport horse breeding does not go unnoticed. For example, the Narragansett Pacer was timed by Reverend McSparran at 2:30 mile back in 1740...it was exciting and important to the people how fast their wonderful sport horse was. Reality check: show jumping was developed by the Irish, not the German, and it was practiced for over a century in their villages and at their hunter meets to test their Hunter Horse, until finally in 1868 it was made a formal sport, with a set of rules, at the Dublin Horse Show. And the Americans even came across the ocean to Ireland and England with our Hunters to compete in these show jumping contests starting in the 1880s. The steeplechase (cross country over fixed obstacles--precursor to eventing) originated in Ireland also, in 1752 and was picked up by England in 1792. 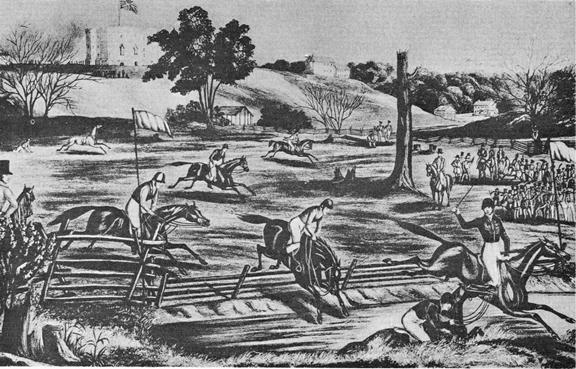 North America's first formal steeplechase is pictured above (1843). All these sports were developed to condition the Anglo-countries' Hunter Horse breeds...there was a full blown Hunter Culture in existence from the late 1500s on in Anglo countries, complete with selective breeding of Hunters. America had show-jumping rings and cross country courses set out in their hunt clubs starting in 1790 to test and condition their Hunter Horse (selectively bred from 1700), and these clubs reached across the entire country by 1835. Steeplechases were regularly performed at all racetracks in America as well. What can we do with this type of willful blindness? I don't think anything can be done, and I for one will only continue to publish what the evidence shows me. We are not supposed to develop a theory and then twist the evidence to fit it, rather we are supposed to develop a theory from the evidence. So ladies and gentlemen, please don't shoot the messenger...I am just reporting facts. Don't read my books or my articles on my website or my posts if you cannot bear to hear what the record reveals to me. I am as surprised as you are at some of the findings, but it does not help the breeder to promote dreams, they need facts.